It’s no surprise to anyone that I think the fourth season of Arrow steeply dipped in terms of quality and character development. The season began with so much promise — Oliver and Felicity were called back to their old lives in Star(ling) City by their team. Domestic bliss interrupted, the pair would have to learn how to become new heroes and different versions of the people they left when they retreated to Ivy Town. Oliver began to embrace a new way of doing things — namely, of doing them in the light. He donned a new costume and spoke in front of the city. And the other persona of the hero, Oliver Queen, also took a bold step into the light in running for mayor. The team, though fractured, was slowly learning how to rebuild itself and its trust in one another. Felicity adjusted to her new role as CEO. Thea grappled with the darkness and anger within her. Diggle learned how to cope with his anger over Oliver, you know, using Lyla and his daughter during Al Sah-Him shenanigans. But then the season took a turn for the worse and never recovered. Instead of introducing organic conflict between Oliver and Felicity, and Oliver and the team, the show chose to use the oldest and most obnoxious cliché in the book: the secret child storyline. I understand that the show introduced Baby Mama during the previous crossover with The Flash and therefore felt the need to address that particular storyline. But take it from the failures of How I Met Your Mother’s series finale — just because you introduce something into your show doesn’t mean you have to return to it in the end. Instead of adding depth to the characters and show, this particular plot made no sense from the standpoint of characterization or larger narrative. I’m going to have a brief interlude here to tell you exactly how this story could have added layers of depth to characters and plot, while also providing an organic source of conflict for Oliver and Felicity (and growth for Felicity, rather than her unfortunate end-result status of being “the woman who got duped by the love of her life”): In the season premiere, Felicity nearly chokes when her and Oliver’s neighbors discuss the idea of having children. She’s younger than Oliver, and though she’s experienced a lot of the world’s heartbreak, she’s also not quite ready to raise a family. The idea clearly freaks her out, which is understandable. Heck, I’m 27 and the idea of raising a child right now scares me. In introducing Baby Mama and William into Felicity’s life, we could have seen this conflict play out, both in Felicity’s own heart and mind and in her relationship with Oliver. The latter would have come forward at some point midseason and told Felicity about his child. Felicity would be shocked, but understanding and embrace Baby Mama and William into her life. Because Felicity is a secure and confident woman and Baby Mama poses no threat to her relationship with Oliver — she knows he loves her and cares for his son. But seeing Oliver have a son would provide this subtle little wedge. It’s one thing to talk about being hypothetical parents with their obnoxious Ivy Town neighbors; it’s another to actually see Oliver already moving forward in an area where she is not confident. Felicity would have struggled, then, with accepting the fact that while Oliver is ready to be a father — and is — she is not sure whether she is ready to be a mother. The story could have evolved their relationship, leading to some deeper questions for Felicity and insight into her psyche (again, this is all canon — raising kids freaks the heroine out) as well as some great material for her and Oliver. This would have added some depth to the Donna/Felicity relationship too, and allowed us to know more about Felicity beyond just her hacking abilities and role on Team Arrow. THAT would have been a compelling story, where Oliver is forced to grow and Felicity is forced to grow and they might grow separately during points in the season (and maybe even just the pressure of Felicity’s grief would drive them apart for a while), but within the realm of what we know to be true of their characters. What was the point in this little detour into “what could have been”? Well, simply to prove that Arrow had some pretty great material to work with this season that they easily could turned into equally great stories. Unfortunately, the show chose to careen down the path of no (easy) return with Oliver and Felicity’s romance, interjected pointless flashbacks, and stretched characterization to fit the writers’ whims. The failures of season four, however, are not impossible to fix in season five. If the show manages to do a few things right, I think that they can reconstruct their narrative into something resembling the show that we all fell in love with. 5. Tighten up the flashbacks, or remove them altogether. Oh, flashbacks. Last season’s Hong Kong flashbacks were terrible, but at least they featured some interesting characters. The same cannot be said of the flashbacks this year. Other than set up Darhk’s magical idol and introduce Constantine, the Lian-Yu return did absolutely nothing in the way of paralleling a theme or serving any purpose whatsoever. In fact, Amanda Waller did a succinct job of summing up the point of the flashbacks in the finale — sometimes you have to kill people. That’s it. That was the whole purpose of the flashbacks this year. I spent half of the season complaining about them and their pointlessness, and the other half muting them altogether. No, seriously. And the worst part is that I lost zero of the narrative while doing this. I lost nothing from muting the flashbacks and if that isn’t a sign that something is wrong, I don’t know what is. In order to create flashbacks that are engaging, the show really needs to cast likable (or at least engaging) actors and actresses to fill roles, as well as weave them strongly into the present-day narrative. The flashbacks in season two were the last that were purposeful and engaging, and as the seasons wear on, they seem to be used to simply fill time and not much more. If this season’s flashbacks will take place in Russia and incorporate a Bratva storyline, there better be some sort of important tie-in during the present. I don’t know what that looks like because I’m not exactly a writer on the show, but I’m sure that the staff can come up with something that is far more interesting and purposeful than they did this year. And if they can’t? Ditch the flashbacks and spend more time constructing a present-day narrative. We promise we won’t miss the flashbacks if they disappear. 4. Pick a central theme and focus on it better. The theme of season four was supposed to be “hope,” but Arrow did such a horrible job of threading that throughout the season that they literally had to repeat it about fifteen hundred times in the finale. Moreover, the longer this show wears on, the more difficult it is becoming for the writers to come up with any other conflict for Oliver besides: “Oliver struggles with the darkness and light within him,” or some variation of that. The finale attempted to re-address that theme, giving Felicity a line about a schism within Oliver. 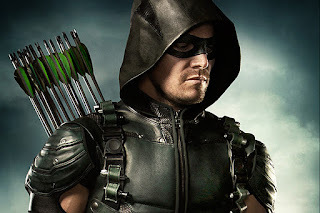 But if I’m being honest, in spite of how rocky and absurd the back half of season three was, it actually did a pretty great job of addressing the theme of identity — a theme which is essentially the exact same thing as “schism.” There are so many more plots that the show could delve into, chief among them being addressing Oliver’s PTSD. In fact, addressing the issue of trauma, in general, could be a really compelling narrative throughout season five. String through that the flashbacks of Bratva!Oliver and the things he had to do in order to survive, and you’ve essentially got a tightly-packed and engaging narrative. The point is that this show has so much potential, because its characters are rich with backstory. Instead, the past few years have seemed to be a “let’s see how many Easter eggs and fun comic book heroes we can integrate,” which caused the show to lose its central focus. And I think that Arrow has so much potential — if only it decides to tap into it. 3. Provide a relevant Big Bad. “Relevant” is a word that might baffle you here, since Damien Darhk and Ra’s al Ghul were both pretty relevant to the plot happening in the past two seasons. And as much as I love Damien Darhk and Neal McDonough, when you examine what the Arrow finale (and season at large) accomplished, you’ll find that it spent most of the year spinning its wheels. In fact, the Legends of Tomorrow/Arrow/The Flash universe has seemed to have this problem lately: they spend their seasons hyping up a Big Bad; their intelligent team of characters can’t seem to defeat the Big Bad at every single turn; the seasons end with the team finally defeating the Big Bad (unbelievably); the Big Bad’s purpose is left far too obscure. Vandal Savage wanted to take over the world because... well, ask anyone who watched the first season of Legends of Tomorrow (including myself) to try to explain exactly WHY he wanted the world to burn. There was no real reason given to us by the show apart from just “because” and “he can.” The same holds true with Arrow. And the problem with constructing a Big Bad who becomes more and more powerful and less and less beatable is that you have to severely dumb down your team, and spend most of the season writing them chasing their tails. At some point, Damien Darhk literally became impossible to stop. We knew this and the team knew this, but apparently the team also did NOT know this because they brought in every person from Constantine to Vixen to a magical lady to help the team defeat him and no one was able to do so. The show had to make the Big Bad last until the season finale, but at that point, it was literally pointless and everything happened suddenly. With the hope of an angry mob, Oliver stripped Darhk of his magic (I think? We actually don’t even know) and managed to beat him up (okay) and kill him (yawn). I loved Darhk because I thought he was interesting and that destroying the world had something to do with his daughter. I thought Arrow was going to reveal to us that she had some sort of incurable cancer and was slowly dying and Darhk wanted to form a protective bubble around her, to somehow save her life. Why were Darhk’s true motives never addressed? Because they never needed to be. Because the show only needed Darhk to be “bad” — they never had to come up with a reason as to WHY. But the problem, of course, is that we needed the “why” answered. In order to care about a hero’s journey, we need to care about his adversaries, too. Look at Fisk and Frank Castle in Daredevil. We care about Matt Murdock and therefore we also care about these characters. How does a show with thirteen episodes per season manage to construct better, more well-rounded villains with engaging ande compelling backstories than a show that has almost double that amount of episodes? So in season five, what I would love to see from Arrow is a villain whose motivations are rooted in something fundamental within Oliver and Team Arrow. I need a villain whose story intersects with Oliver’s and makes sense. I need a villain who is believable and also able to be stopped, at some point. And please, for the love of God, don’t make their whole quest about destroying the world. 2. Deal with the problem that is Malcolm Merlyn. I love Barrowman so much, but I have absolutely no idea why Malcolm is still alive on this show. He’s betrayed everyone — literally everyone — about a hundred times in a hundred different ways, and yet he’s still survived. He sold out Oliver’s child to Darhk in exchange for he and Thea living in The Dome. He brainwashed his daughter to kill. He’s the reason Laurel died. He continues to play both sides without any sort of remorse or a moment of hesitation. So why doesn’t Oliver want to kill him? Because he’s technically Thea’s father? I understood his reasoning for not killing him when Nyssa demanded that he do so. I get that Oliver Queen is all about finding another way and he managed to do that, without any sort of help from his team. But there’s a time and place for niceties and there is a time and a place for Malcolm’s demise. Honestly, I was extremely baffled as to why or how he became a part of Team Arrow taking down Darhk during the season finale. Did I miss something or was anyone else confused as well? When did he switch sides? Why does Team Arrow not seem to bat an eye that he’s in their lair again? Malcolm has been playing both sides to get what he wants. And I, quite frankly, just don’t see how he will be useful or relevant to the story next season. There are only so many times Malcolm can betray and then un-betray a team, confess he loves his daughter and then literally brainwash her. And even though I absolutely love John Barrowman’s performance in this role, I can’t fathom how he’ll be necessary moving forward. The show’s purpose in all of this isn’t to keep Malcolm Merlyn alive — they’re simply intent on keeping John Barrowman employed. 1. Rebuild its central relationships. I’ll be clear here: I don’t want Oliver and Felicity to get back together until at least midseason. And here’s why: anything earlier would cheapen the betrayal that Felicity felt. She still has to process a lot of what has happened to her in the past few months (directing a nuclear warhead to a small town; watching two people she cared about die; Oliver’s betrayal; her dad leaving town again; loss of her company, etc.). Honestly, this girl has so much to deal with personally and professionally, Oliver should be relegated to the backburner. Now, this doesn’t mean I want the two to remain isolated. I think that Felicity has proven she can compartmentalize better than she thinks she can. Working together doesn’t mean Oliver and Felicity should (or have to) fall right back into a relationship (#sorrynotsorry, shippers). But because Arrow chose to leave Felicity behind — a decision I’m not entirely on board with, to be honest, given the sheer amount of trauma Felicity experienced in the city this year — they need to be very careful how they tread the relationship between these two in season five. I want Oliver to work to earn back Felicity’s trust, and I want Felicity to take some time and headspace to properly deal with the pain that she briefly mentioned to Oliver earlier this season. If breaking up with Oliver was the hardest thing she’s had to do, I want to SEE that and not be TOLD it, show. I think we’ve all learned the value of showing rather than telling. Furthermore, I don’t want a love triangle and I know that I don’t control the Arrow writers, so there’s no need for me to tweet that to them. Let me repeat that: I don’t control what they do. I am, as a fan of the show, not in any way believing that I make things happen or that the executive producers choose to do or not do things based on how I feel any given Wednesday. Like I said in my review of the finale: I don’t want the show to listen to every whim that I have or story I think works. That’s why I’m a fan, not a writer of the show. I digest and interpret their stories; I don’t make them. With that said, again, I think that the show will be headed into some pretty dangerous waters if it decides Felicity needs a non-Oliver love interest. They tried that in season three with Ray, and nothing about the relationship felt true to Felicity’s character. We know that these two love one another. Oliver and Felicity’s love for each other is not the problem here. The problem is whether or not Felicity and Oliver can grow enough separately and together in order to permanently repair a relationship that was fractured. And I think that the show can. But I know that they need to do so slowly and intentionally — something that was not done this season. Oliver and Felicity were not treated with delicacy, nor was the baby mama drama storyline given any sort of consideration in terms of how it might impact both characterizations. But if it takes the time and slowly (and organically) rebuilds Oliver/Felicity in the same way that it built them up the first time, we’ll be okay. But more than just that, I would love to see more relationships explored this season that have been pushed aside for annoying drama. Thea and Oliver’s relationship is super important and the most important on the show (they’re the only real family each other has left, guys) and it hasn’t been explored enough this season. With the loss of Alex, Laurel, and Roy as well as her rocky relationship with Malcolm, Thea is just wandering and lost. I want her big brother to take her under his wing and to be vulnerable with her. I want both of them to talk about their trauma, or at least share some scenes together that evolve their characters. The same holds true for other pairings on the show as well, but none more so than the Queen siblings. With all of that said, what do you think Arrow should do in its fifth season to save the sinking parts of it? Hit up the comments below and let me know! I'm going to disagree on a few points, and agree on a few others. Merlyn - I'd just like to mention that in addition to killing a bunch of people in the Glades, and brainwashing Thea into murder (a couple of times, I think - weren't there some assassins in Nanda Parbat as well), and oh killing Tommy (which he doesn't seem to care about AT ALL), he is also responsible for Robert Queen's death and Oliver's initial shipwreck and ordeal? He could be such a great, great villain, if they didn't forget all the bad stuff he's done. Flashback - why isn't Oliver more like Merlyn in the flashbacks? I mean why isn't he more like one of these end-justifies-the-means psychos? That could be super entertaining in a cheesy action flick kind of way. I so totally hated these flashbacks. Ivo and Slade were great villains because they were horribly friendly and believable - until they weren't. I want the next villain to be a real person villain. I understand in the season of "hope" the villain needs to be about "despair" but I totally agree that Wilson Fisk on Daredevil stands head and shoulders above any villain on Arrow apart from Slade. So, if season five flashbacks are Brava, I want Oliver to try to stamp out crime as mayor, and have to do dubious deals with the mob, and I want the villain to be Knyazev, and I want to see him and Oliver get to be best friends, and I want to see Oliver have to be the "villain" and take him down for the sake of the city. Another thing that would really improve Arrow for me is more of Oliver as a really, really kickass fighter in hand-to-hand combat. I want to be wowed with his physical prowess. It's like a sign that he's a REALLY unusual and special person. I loved that about season 1. I feel that his physical condition should even IMPROVE. I love your "what could have been" scenario of how Oliver's son could have been used for his and Felicity's relationship. That would have improved a part of the season immensely.